Headphones are extremely popular – anytime you walk down the street, you’ll be sure to see someone wearing the latest model. But are headphones bad for you? Can they be damaging your hearing? If you aren’t careful, it is possible that they may cause damage to your hearing over time. Almost everyone has a smartphone these days and listens to music with headphones or earbuds. But there is a real risk that you may be causing your ears damage at the same time you enjoy your favorite music. Headphones on their own aren’t bad for you. It is the volume at which you listen to music which can cause problems. Anything which produces an excessive level of noise in close range to your ears can be dangerous, and cause damage to your hearing. What happens as sound waves reach your ears? It makes your eardrum vibrate. The vibration then gets sent through some small bones to your inner ear. It continues until it transmits to your cochlea. 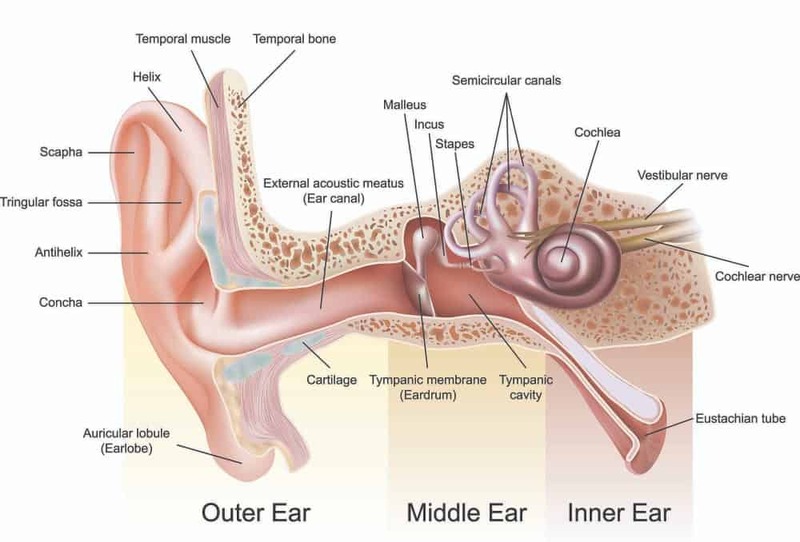 The cochlea is a chamber in your ear which is fluid-filled and contains many thousand minuscule ‘hairs.’ Anytime sound vibrations touch the cochlea, the fluid vibrates inside it. This makes the hairs move. The louder the sounds, the stronger the vibrations, and the more the hairs will move. Listening to sounds for extended periods can lead to the hair cells becoming less sensitive to vibrations. A lot of loud noises lead to the cells bending or folding over completely. When you experience the feeling of ‘temporary hearing loss’ such as after being at a loud concert, this is what occurs. The hair cells need time to recover after being exposed to the extensive loud noise which caused the prolonged vibrations. Conversely, in some cases, permanent damage can be caused, and the cells may never recover. If they are damaged too much, they are no longer able to work as they should, which leads to hearing loss. If you experience hearing loss, there is currently no cure available to be able to repair an inner ear which has been damaged. Headphones can damage your ears just like any other device that produces loud noise. You may think that why are devices capable of causing permanent damage sold freely to the public? Well… they do have the capability, yet to cause permanent damage to your ears, you really need some silly things. Let’s get into a little more details. Over time, your headphones’ sounds can lead to your hair cells inside the cochlea bending down too frequently, or severely. If there isn’t enough time for them to recover, it can lead to permanent damage. You should also be aware that headphones can still cause damage to your ears even if they aren’t at maximum volume. Even if you listen to headphones at a moderate level for a longer duration, it can lead to hearing damage over time. It’s not only how loud the sound needs to be to cause damage to your ears, but it’s also the duration of the exposure. As an example, using blaring power tools, or going to a live concert can cause the same amount of damage to your ears like an explosion, or a gunshot could. In other words, the length of the sound exposure is just as important as the volume of it. At the same time, it is important to clarify that whether it is the top premium, budget or best open back headphones under 200 dollars – when it comes to hearing damage, they are all equal. Can headphones make you deaf? The short answer is yes and the term for that is NIDCD, which stands for Noise Induced Hearing Loss. Headphones, like all other audio devices can technically cause permanent hearing damage and loss of hearing as a result. Over a long period, they can cause you to go deaf, but it will only happen by misusing headphones. 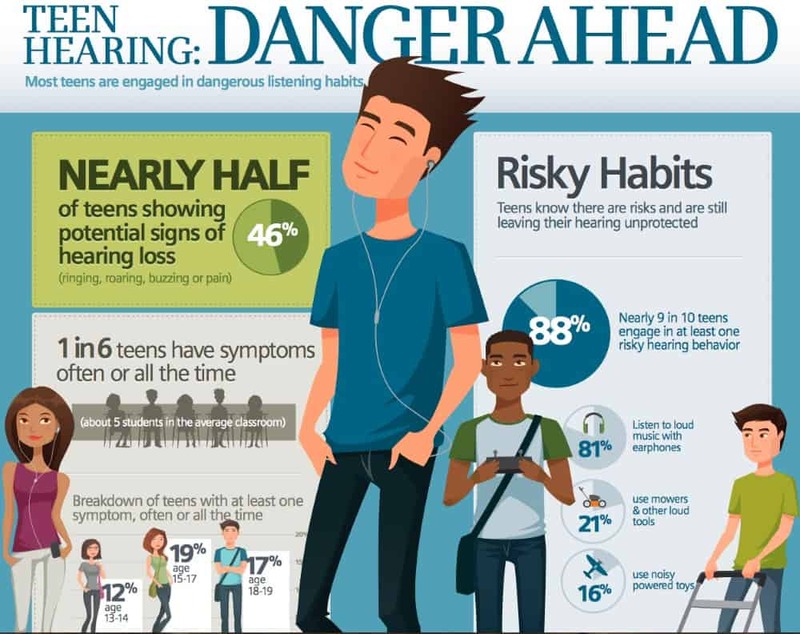 If you listen to headphones at safe listening volumes, then it is quite unlikely to cause any damage to your hearing. It’s better to be safe now than regret the damage you will do which will affect you for the rest of your life. The Hearing Review have done the analysis that suggests that inappropriate use of sound producing devices is growing concern for hearing loss, see the diagram below. Let’s take a look at different noise levels, and the time it takes before it causes damage. 80 dB it takes 25 hours before damage, which is equal to a telephone dial tone. 86 dB it takes around 6.5 hours before hearing damage occurs, which is equal to the sound of city traffic. 92 dB takes about 1.5 hours before hearing damage and is equal to highway traffic. 95 dB takes approximately 45 minutes and sounds like a Jackhammer 50 feet away. 101 dB takes 12 minutes before damage and is equal to a hand drill 3 feet away. 107 dB takes 3 minutes and sounds like a lawnmower which is 3 feet away. At 113 decibels it takes only about 1 minute before hearing damage can occur. At this volume, it is like hearing a rock concert or power saw. As for headphones – they can emit a maximum sound level that ranges between 85 to 110 dB, which corresponds to the orange section of the chart above. It can take anywhere from 6 hours of continuous listening on the lowest level to just 1.5 minutes if listened to at maximum volume for hearing damage to begin. Music lovers who listen to headphones all day should carefully monitor the volume level and take regular breaks. As each pair of headphones has a different maximum volume, it’s hard to measure the dB levels accurately. It’s generally accepted that a safe listening volume for all headphones is with the volume at a maximum of 6 (out of 10). If you would like to learn a couple of handy tips on how to protect your ears from noise induced damage, you may enjoy the video from Mayo Clinic below. Are Headphones Bad for Your Brain? Headphones generate electromagnetic waves, which are hazardous to the brain in the long-term. As the inner ear connects with the brain, if any infection or damage occurs in your ear, it can also affect your brain. Loud music also causes damage to nerve cells. It also affects nerves in the same way which multiple sclerosis does. Exposure to loud noise levels for prolonged periods will damage nerve cells’ protective insulating myelin sheath. This carries signals from your ear to your brain. Myelin acts as a protective coating, and if it is lost, it will disrupt electrical nerve signals from your brain. This can cause either partial or total deafness. 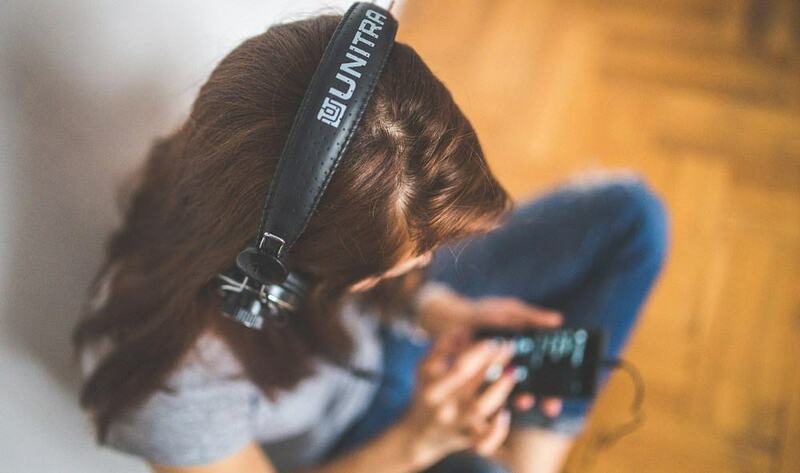 Overall, using headphones is not bad for you, if you use them responsibly and safely while you enjoy your favorite music. However, listening to music at extreme levels or for extended periods can lead to hearing loss, and in extreme cases hurt your brain.